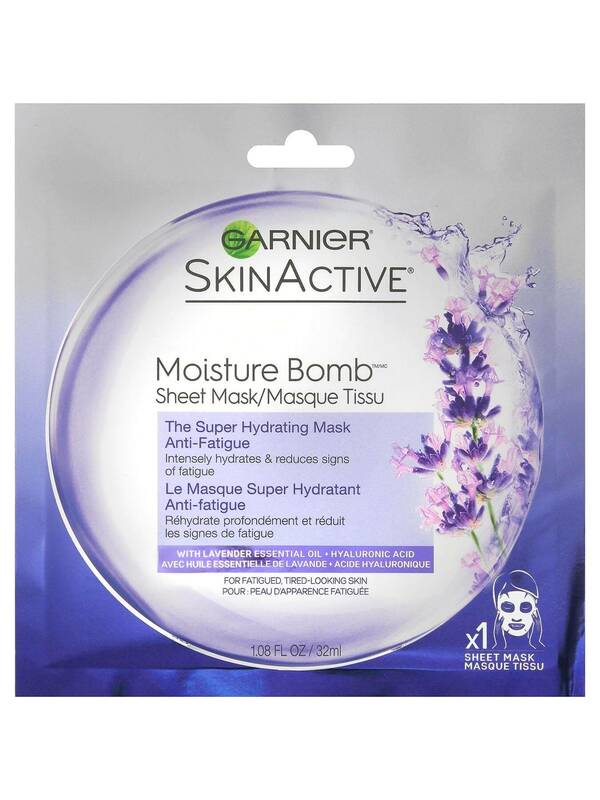 This water-based hydrating sheet mask with Hyaluronic Acid, an ingredient naturally found in skin, floods skin with intense weightless hydration. Free of mineral oil and parabens, this non-greasy formula with lavender essential oil, revitalizes skin and reduces signs of fatigue. Originally grown in traditional groves in the French countryside, Lavender is known for its fragrant oil. This natural oil is widely infused in skin care and hair care formulas that restore shine and soothe damage. Rated 2 out of 5 by Laurelee from Not bad I liked that the mask stayed on well despite its very wet feeling. When I took it off and let my face dry it felt sticky. When it was dry it started to feel tight so I had to use my regular moisturizer. I can’t say it I saw any results but I’m not sorry I tried it. I will try it again before bed next time. Rated 5 out of 5 by Dar C from Better Than Expected I received a free sample but was hesitant that it would work for me. First I was impressed that it covered my whole face as others that I have tried were much smaller. Yes, it left my skin feeling soft and refreshed. Rated 4 out of 5 by Libz25 from Feels great! 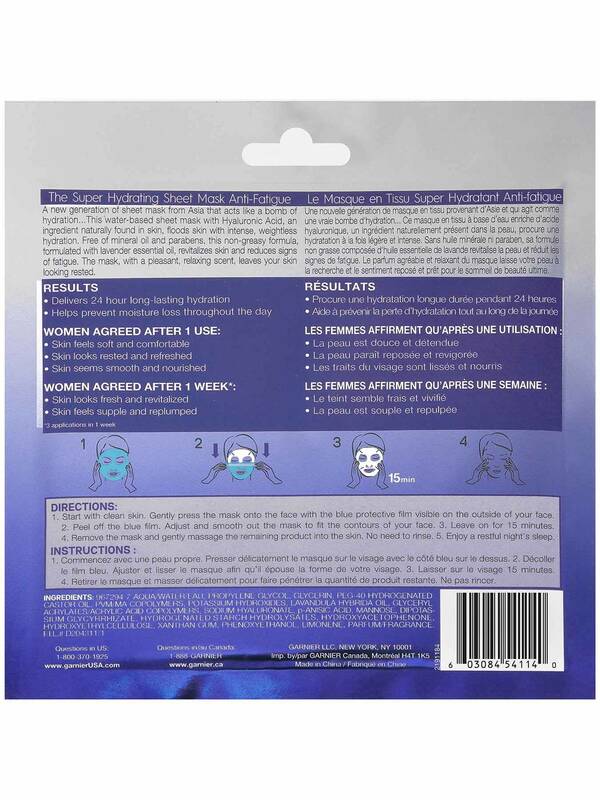 The anti-fatigue mask is my favorite it's perfect right before bed! My skin felt so mositurized the next morning and it smells amazing! Rated 5 out of 5 by lilybugbaby from Really great mask! I really enjoyed this mask! It smelled very nice and was extremely effective at hydrating my face. My face also felt very firm and soft once I removed the mask. I would definitely purchase more in the future. Rated 5 out of 5 by Rshbkr from Perfect for new moms! I am a huge fan of things you can put on your skin and not have to wash off. I am such a minimalist; the least amount I have to do to get ready, the better. That's why I loved this product. You first start off by washing your face so you're applying the mask onto clean skin. You place the mask on your face aligning it with you eyes and mouth then peel off the blue top layer. Now is the best part: 15 minute nap! Being a mom of three I cannot sit still for more than five minutes unless I'm lying down. More often than not, every time I get to lay down I end up taking a nap. So this mask was a good excuse for a little me time. After 15 minutes you take off the mask and rub in the excess moisture and you're done. This was so easy and not messy like other masks I've used. I will definitely be using this product again. Rated 5 out of 5 by abelic16 from This mask is ahhhmazing! After a stressful day yesterday my body AND my face were worn out. I popped this mask on and watched tv while I let it get to work on my skin. When I took it off I was expecting a weird residue to be left behind but was pleasantly surprised by how nice and clean my face felt. I've never used this word to describe my face before, but it was supple! I will definitely be using these masks more in the future and recommend them to other ladies with oily skin that may be wary of using things labeled as "hydrating". Rated 5 out of 5 by jmonti12 from Best way to relax and improve your skin! I am a long time fan of all masks and this one is beyond impressive. First of all, the lavender scent is very soothing. Once placed, the mask stays on well and does not slip off easily. And the moisture it provides, is beyond amazing! After I took it off and pressed the excess into my skin, my face felt soft and smooth and I woke up with an a healthy glow. As someone with oily/combination skin I was concerned that this would provide too much moisture and would break me out. Not at all. I would recommend this mask for all skin types. Anyone who needs a boost of moisture in just 15 minutes this mask is for you!! !